The first theme of Main Gallery One is Revolution. Manchester was once at the centre of Britain’s Industrial Revolution. Based on the cotton textile industry, the town became the world’s first industrial city. Despite high wages in good times, workers endured appalling living and environmental conditions. Little could be done to improve these; there was no political structure and Manchester had no MP. On 16 August 1819, 60,000 people gathered on St Peter’s Field in Manchester (now the area around St Peter’s Square) seeking some of the rights that we take for granted today. When local government troops charged at the crowd, the peaceful protest was turned into a massacre with 18 people losing their lives and around 700 injured. The event became known as the Peterloo Massacre and led to the first reform of Parliament in 1832. This section is all about the birth of democratic ideas. This includes the Levellers, the Chartists and individuals such as John Wilkes, Tom Paine, Mary Wollstonecraft, William Cobbett, Francis Burdett and the Cato Street Conspirators. The Great Reform Act was passed in 1832 giving the vote to some. Two of the oldest banners in the museum’s collection are on display in this section – the Liverpool Tinplate Workers’ banner from 1821 (the oldest trade union banner in the world) and the White Lion Lodge banner from about 1830 (the world’s oldest surviving miners’ banner). Manchester manufacturers developed the Anti-Corn Law League whose ideology was free trade and liberalism. They created The Manchester Guardian newspaper, and the Free Trade Hall in Manchester marks the celebration of the repeal of the Corn Laws in 1846. Their campaign led directly to the creation of the Liberal Party. This section covers secret societies – which existed before trade unions were legal and were often large, national organisations. Displays include information on the Tolpuddle Martyrs; six workers arrested and convicted for attempting to form a union in 1834. They were all pardoned in 1836 following a public outcry. We then follow the growth of the trade union movement, including the differences between unions for skilled and unskilled workers, and the workers who found it hard to join a union, such as home workers. The Trades Union Congress (TUC) held their first meeting in Manchester in 1868; the building where this first meeting took place is 103 Princess Street, where the museum’s public galleries were based in the early 1990s (before moving to the present location), with spaces there now used as our collections stores. Strikes covered in the section include the 1888 strike at the Bryant & May match factory in London and the Dock Strike of 1889. This section covers all the main political parties and political movements. Subjects covered include early socialism (plus the Clarion movement), the Conservative and Liberal Parties, the birth of the Labour Party, the Communist Party of Great Britain, including the Spanish Civil War, fascism and post war politics including the General Strike. Another aspect of this section is about how women had to fight for the right to vote on the same terms as men. 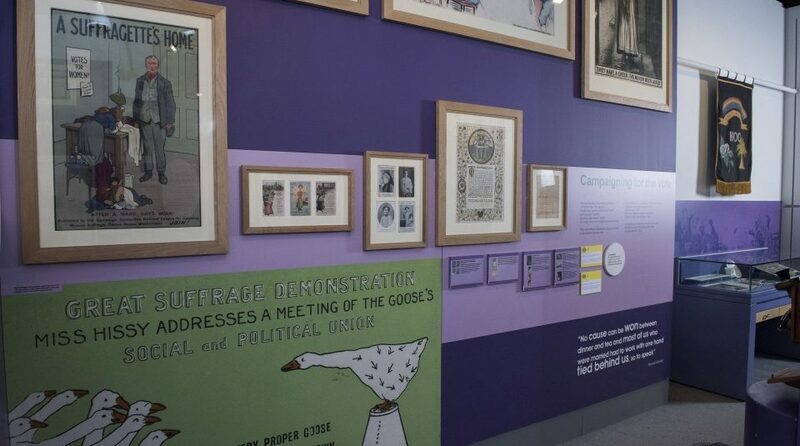 The section includes the formation of the Manchester Suffrage Society in 1867 and the Women’s Social and Political Union (WSPU) founded in Manchester by Emmeline Pankhurst and her sisters in 1903. The story told in Main Gallery ends in 1945 at the end of World War II. The story continues in Main Gallery Two.